What better way to enjoy our beautiful Kootenay winter than an evening of guided snowshoeing or fat biking under the moonlight with friends and family? Get ready for a great evening out in our third annual Moonlight Snowshoe & Fatbike Quest featuring excellent food, outdoor fun, adventure and prizes - all in support of a great cause! 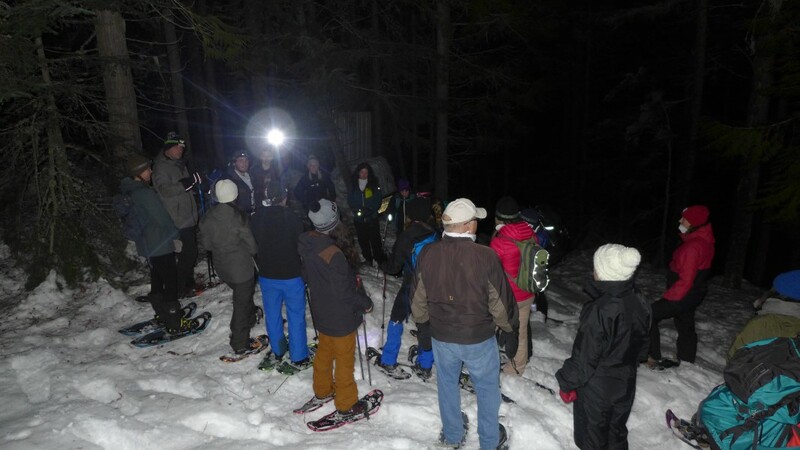 The Moonlight Snowshoe & Fatbike Quest is the West Kootenay Take a Hike Program’s annual fundraising event to raise funds and awareness for its alternative education program which operates in School District 20. The event aims to showcase an innovative approach to education that engages students who typically struggle in the mainstream school system. Take a Hike students will help to host the evening and share inspiring personal stories from their experiences in this program, which is designed to provide an optimal environment for success. After a delicious hot meal, experienced professional guides from Kootenay Snowshoe Tours will lead registered groups on a moonlight snowshoe or fatbike trek as they complete the quest! After your trek you return to the Resort for hot drinks, prizes and awards. Tickets are only $29 and must be purchased in advance. Find them in Rossland at Kootenay Gateway; in Trail at Gerick Cycle & Sports; in Castlegar at Cycology Bikes; or online through our website at www.takeahikefoundation.org/events. Please note that snowshoe and fatbike rentals are not included in ticket price but are available for minimal fee. Participants must contact us in advance if rental equipment is needed. Take a Hike is an innovative education program that engages at risk youth through a unique combination of academics, therapy, adventure-based learning, and community involvement. Now in its 6th year in the West Kootenays, we operate in partnership with School District #20 (Kootenay-Columbia) and support students from throughout the region. The team behind Take a Hike includes teachers, youth and family workers, clinical therapists, adventure-based learning specialists, and volunteers. The program fosters the optimal environment for students to experience success and provides students the opportunity to rebuild relationships, develop life skills, graduate and give back to their communities. The event will take place Thursday Feb. 21 from 5-9 p.m.